Polygon Solution’s innovative letter broach is a unique on-machine alternative to present day stamping and punching techniques for marking parts. Polygon Solution’s Letter Broach is a new cutting tool used to create letters or numbers in metal parts. The Letter Broach is used in a rotary broach tool holder and is driven in a rotary motion around a fixed pivot point. This rotary motion reduces wear on the cutting tool, and eliminates secondary operations. Letter Broaches may also improve tooling costs and quality systems. Typical methods of marking parts with letters or numbers include stamping presses, hand punches and automated methods which forcefully press a stamp into the metal part. This new method of marking eliminates the impact of a high powered press or hammer, and gently displaces the material until the desired depth is achieved. The reduced impact will improve life for the cutting tool, tool holder and machine. Using the Letter Broach within the machine eliminates secondary operations and reduces opportunities for operator error. Cost savings can include less machines, manual labor and tooling costs. The Letter Broaches are designed to fit inside most industry standard rotary broaching tool holders. Soft materials including aluminum and brass are ideal for rotary broaching. The nominal broach depth for letter marking is about .005 – .010”. Various characters and symbols can be made, sometimes including multiple characters or custom designs. 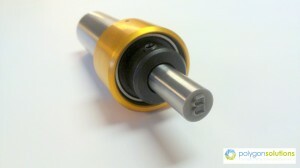 Polygon Solutions Inc. is an innovative manufacturer of rotary broaching tools. Polygon’s Letter Broaches are the same size as standard hexagon and square rotary broach tools, and will fit into the popular GT Series rotary broaching tool holder. For more information about all of Polygon’s products, please visit our website: https://www.polygonsolutions.com.